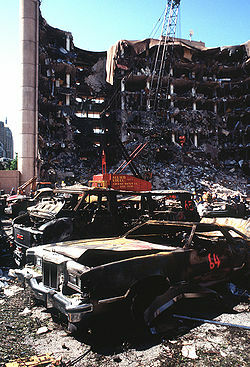 Oklahoma City – April 19,1995 – We Shall not Forget !! Hard to believe it has been 16 years since Oklahoma City, the state of Oklahoma, and our Great Nation suffered one of the worst acts of terrorism on home soil. 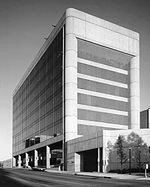 Until September 11th, The Alfred P. Murrah Federal building bombing was the most vicious act of evil on home soil. This repulsive and offensive act stole 168 lives. 19 of those lives were just children under the age of 6. I refuse to discuss the beastly depraved creature and his cronies that caused this disaster. This is MY blog and I choose to talk of survivors and heros who risked their lives to aid the fallen. I am talking about the policemen, firemen, and the average people on the street who rushed to aid the more than 680 injured by the blast. I remember April 19th as well as I remember September 11. I recall the vivid raw emotion that played out on the television. I remember the gut wrenching pain as workers carried small wrapped bodies out of the devastation. I remember the sheer misery and turmoil in the faces of rescue workers. Now that I have tears in my eyes, let me also say that out of the chaos of that day you will find heroism. The Survivor Tree (named for surviving the Bomb blast) stands as a symbol of the endurance of Oklahomans. Did you know more than 9,000 units of blood were donated to the Red Cross. Over 100,000 meals were served by The Salvation Army. Nearly 20,000 of those meals were provided by the Oklahoma Restaurant Association who were holding a trade show in Oklahoma City at the time of the bombing. Lets not forget the 29 million dollars raised for the Memorial that now stands where the Murrah Building once stood. Motto "We come here to remember those who were killed, those who survived and those changed forever. May all who leave here know the impact of violence. May this memorial offer comfort, strength, peace, hope and serenity"
So we shall not forget those stolen from loving families, those heros whose endurance never failed until the last was pulled from the ruins, and outpouring of love from citizens of the great nation we call HOME! Previous Try New Seneca Farms Oatmeal and Fruit for a Healthy Start to your Day! Next Awe-Inspiring Book “The Help” Coming to Theatres!